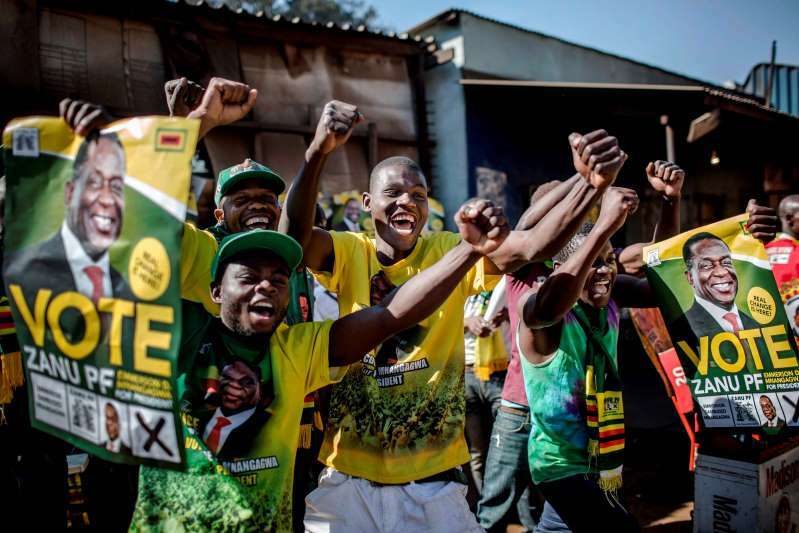 Supporters celebrate after Zimbabwe's President Emmerson Mnangagwa was declared the winner in Mbare, Harare. When Robert Mugabe was forced to resign in November after nearly four decades in power, Zimbabweans hoped for a return to the international community that had ostracized them, led by a new, more legitimate government. Instead, its first election without Mugabe on the ballot has plunged the country into a new crisis. [post_ads]The international community has remained mostly quiet in recognizing or congratulating Mnangagwa as Zimbabwe’s rightful next leader. The United States and the European Union have been clear that a credible election is their foremost condition for the lifting of sanctions and for backing a bailout from the International Monetary Fund. The ways that Zimbabwe is freer than it was before Mugabe’s ouster were on display during the campaign and the election: There is greater freedom of expression and less state-sponsored violence. But also visible was the heavy hand of a well-established apparatus of control. According to the election commission, Mnangagwa won 50.8 percent of the total vote. His party also won a two-thirds majority in parliament. Chamisa took more than 70 percent in Harare, and nearly doubled the MDC’s total votes over the previous elections. Chamisa has not released any evidence of the alleged rigging, and until he does so, his role is largely a destabilizing one, said Pigou. But ZANU-PF and the election commission have also not released their own vote totals from individual polling stations, which is what the MDC expects to use as its main evidence of rigging. By Friday, people in Harare were back to work after a week of tension and chaos downtown, with opinions sharply divided over the 75-year-old president who some see as their savior and others fear is even worse than Mugabe. Wednesday and Friday’s crackdowns on opposition gatherings also gave some a reason to believe that Mnangagwa would work closely with the army to clamp down on dissent, much like Mugabe did. For years, Mnangagwa was Zimbabwe’s defense minister and head of intelligence, and is accused of orchestrating some of Mugabe’s greatest atrocities, including massacres of tens of thousands of members of a minority ethnic group, the razing of neighborhoods with major opposition support, and the campaign of violence that forced the MDC to boycott a runoff in the 2008 elections. On Friday, the Zimbabwe Election Support Network, a reputed group of domestic observers, released a report corroborating the election commission’s results, saying it was in line with their own projections. The report called on the commission to immediately and publicly release results from polling stations to ensure transparency and defuse concerns about manipulation. World - U.S. Daily News: Zimbabweans voted for change. They got a new crisis instead.